A) EB07026 and B) ABIN334495 (0.3µg/ml) staining of Human Bone Marrow lysate (35µg protein in RIPA buffer). Primary incubation was 1 hour. Detected by chemiluminescence. Immunogène Peptide with sequence C-QSDDEPKRIKKS, from the internal region of the protein sequence according to NP_005622.1. 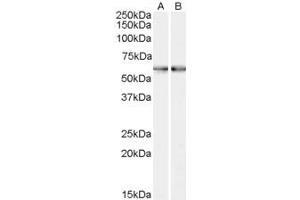 DS WB Results: Approx 60 kDa band observed in Human Bone Marrow lysates (calculated MW of 86.4 kDa according to NP_005622.1). The observed molecular weight corresponds to findings with EB07026, a product of different design reacting to a different part of the same protein. Recommended concentration: 0.1-0.3 μg/mL. Primary incubation was 1 hour.